APP.COM - COSTLY MANDATE OR BASIC RIGHT? COSTLY MANDATE OR BASIC RIGHT? John Schwebel pushes his wife, Carolyn, past the wheelchair ramp in front of the new Monmouth County Agriculture Building in Freehold Township. The ramp's location, extending into two parking spaces, has prompted Carmena Stoney and Schwebel to file suit over alleged ADA violations. County Courthouse, Freehold: Ramp at front entrance lacks required handrails; bathrooms inaccessible; handicapped parking improperly designed. Human Services Building , Freehold Township : No accessible bathrooms, emergency telephones, or water fountains; accessible walkways have slopes steeper than permitted by law. Agriculture Building, Freehold Township : Parking design improper; bathrooms inaccessible. Police Academy , Freehold Township : Improper disabled parking spaces; no proper access routes. Hall of Records, Freehold: Inaccessible bathrooms and water fountains; door "push-pull weight" greater than 5 pounds. Office of Economic Development and Tourism, Freehold: No accessible parking or route to building. County Clerk's Office, Freehold: illegal curb cuts; improper bathrooms. The lawsuit also alleges that many county parks do not have accessible routes, parking or bathrooms, and that there are improper curb cuts at many county-owned locations. "If they had listened to me, when I told them last year, this could have all been avoided." - Carolyn Schwebel, co-chairwoman of advocacy group: The Equalizers. FREEHOLD TOWNSHIP — The year-old Monmouth County Agriculture Building on Kozloski Road cost $500,000 to design, $5 million to build and $500,000 to furnish. But county officials balked at spending an additional $1,000 to repair what a federal agency contends is an improper handicapped-access ramp — a position that could cost them even more in legal fees. The federal Americans With Disabilities Act was signed into law 15 years ago today, but Carolyn Schwebel of Middletown, Carmena Stoney of Aberdeen and others with disabilities say they still encounter government buildings and businesses that they find to be nearly inaccessible. Schwebel and Stoney, who said they warned county officials about the parking lot problem during the Agriculture Building's construction, have filed a lawsuit against county government alleging that physical barriers in violation of the federal law have impaired their ability to use services at seven specific county locations. Critics of the 1990 law say that such lawsuits have become commonplace, and that the act created an unfunded mandate that the public and private sectors have a hard time meeting. "The federal government is saying to local government, "You have to provide all these things in buildings, but we're not going to give you any money for it,' " said Edward L. Hudgins, director of The Objectivist Center, a Washington-based not-for-profit think tank. "Often these one-size-fits-all mandates are very costly and can be counterproductive." But Schwebel said federal money is available to fund a portion of the work needed to adapt buildings. At issue at the Agriculture Building is a short, concrete ramp that slopes from the sidewalk to the handicapped parking spaces. The ramp, designed to accommodate wheelchairs, extends into two of the parking spaces. A car parking in one of those spaces could block access to the ramp. And if that parked car has one tire on the ramp, it would tilt, causing exit and entry difficulties for a wheelchair-using occupant, the women said. "Every little bump throws you off," said Stoney, 65, who often depends on a cane. She said she was afflicted with severe spinal stenosis 18 years ago and has had recent heart problems. Schwebel, 61, is disabled by cerebral palsy and makes use of a wheelchair. The two are co-chairwomen of The Equalizers, an advocacy group for people with disabilities, but they have filed the lawsuit as private citizens. "If they had listened to me when I told them last year, this all could have been avoided," said Schwebel, speaking about the Agriculture Building. County Administrator Louis Paparozzi said he would not comment because of the pending litigation. Marsha Mazz, an official with the federal Access Board, an agency that monitors compliance with the ADA, agreed the parking space ramp does not comply with federal law. 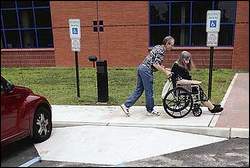 "You cannot place a built-up curb ramp in an access aisle," Mazz said. "The problem with built-up curbing in an access aisle has to do with deploying a wheelchair onto a sloped surface." In correspondence with Schwebel, county officials contended that the parking spaces at the building comply with all applicable law and that they have sufficiently addressed her complaints. "What irks Carolyn most is that she told (county officials) about the accessibility problems with the Ag Building during construction of the accessibility problems," said attorney Anthony J. Brady of Camden, who filed the suit on behalf of the two women. It's one of seven county buildings that violate the federal law, according to the lawsuit. In addition, many county parks do not have accessible routes, parking and bathrooms, and there are improper curb cuts elsewhere on county-owned property, they said. The buildings named in the suit include the Monmouth County Courthouse, 1 Monument St., Freehold. In a decision issued on May 16, 2004, the U.S. Supreme Court ruled that access to state courthouses is a basic right and that the ADA allows disabled citizens to sue for damages if a state fails to provide access. The ruling came from the case of a paraplegic man who crawled up the steps of a small-town courthouse because there was no elevator for his wheelchair. Enacted on July 26, 1990, the Americans With Disabilities Act was hailed as the nation's first comprehensive civil rights law addressing the needs of people with disabilities, prohibiting discrimination in employment, public services, public accommodations and telecommunications. Hudgins of The Objectivist Center said state and local governments and private businesses "at the time were already in tune with the intent, and the law was not necessary. It wrecked a lot of the momentum that was in place. Employers previously willing to give someone with a disability a chance now hold off, saying, "If I hire someone with a disability, is this person a lawsuit waiting to happen?' "
Schwebel and Stoney said their lawsuit against Monmouth County is intended solely to have accessibility upgrades made at the buildings, and they will seek to recover legal fees.